Our luxury holiday apartments in Westward Ho! offer 2 or 3 bedroom self catering accommodation for up to 6 people in high specification holiday apartment rentals in two locations in North Devon. Our Westward Ho! holiday apartments are tastefully designed to offer a stress free, family holiday near the Westward Ho! beach with some extra special comforts to help you relax including Jacuzzi bath, complimentary toiletries, linen and towels along with modern utilities such as underfloor heating, wireless sound systems, dishwashers and large Smart TV’s with Netflix. All of our apartments have balconies with outdoor furniture to help you make the most of those views and some come with hot tubs and a garden. Each holiday apartment is individually tailored and designed to help you get the most out of your holiday. Westward Ho! has long been a popular holiday resort for families and was specifically developed as a resort in the latter half of the 19th Century. The attractions today remain the same, a fantastic blue flag sandy beach with a range of watersports available, a surf school and The Royal North Devon Golf Course which is the oldest golf course in the country. Westward Ho! has a thriving and rejuvenated village centre that has developed significantly in recent years with a host of new and modern restaurants and shops. There are plenty of places to visit nearby, family attractions and adventure parks, walking along the coastal path and fantastic shopping. Westward Ho! is an ideal location for a family holiday in North Devon. 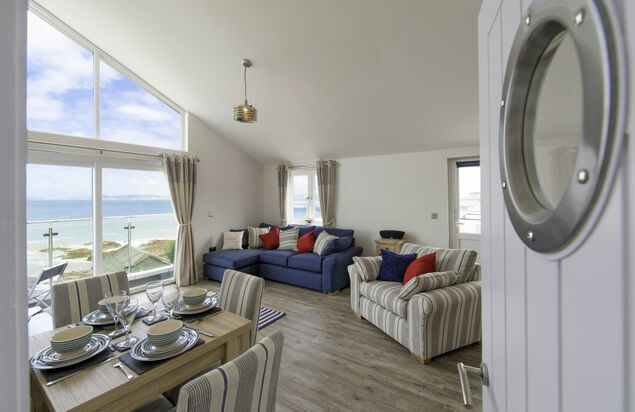 Driftwood at Beachside offers stunning views over Westward Ho! beach from a modern, open plan apartment with all your mod cons and a fantastic balcony with hot tub which is great for watching the surf! Sea Breeze at Beachside offers stunning views over Westward Ho! beach from a modern, open plan apartment with all your mod cons and a fantastic balcony which is great for watching the surf! Pebble Ridge is perfect for families of up to 4, with an enclosed garden and a balcony with a hot tub where you can really unwind. This apartment boasts a range of luxury features including Smart TV with Netflix and wireless sound system. Enjoy your evenings after a day at the beach in the hot tub on the fantastic balcony at Sandymere. Soak in the bubbles and relax in this luxury apartment that sleeps four, complete with Smart TV, Netflix, wireless sound system and a whole host of other fantastic features. 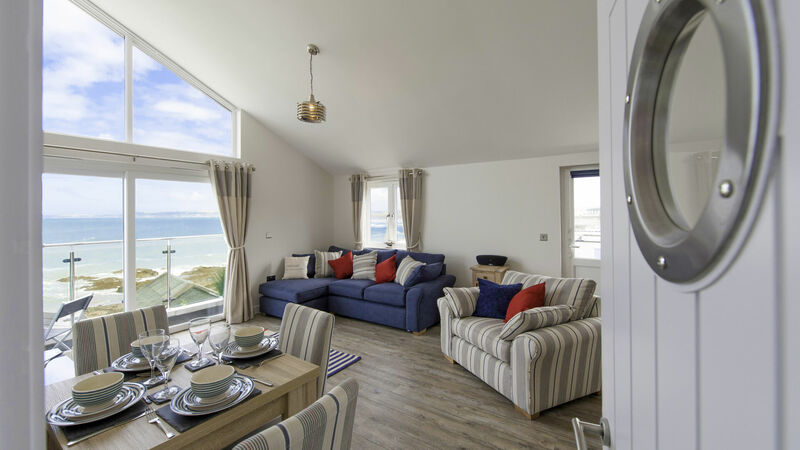 Breakwater is an open plan holiday apartment that sleeps six people with a range of luxury features including Bluetooth sound system, TV's in all bedrooms and is available to book for ten months in a year. 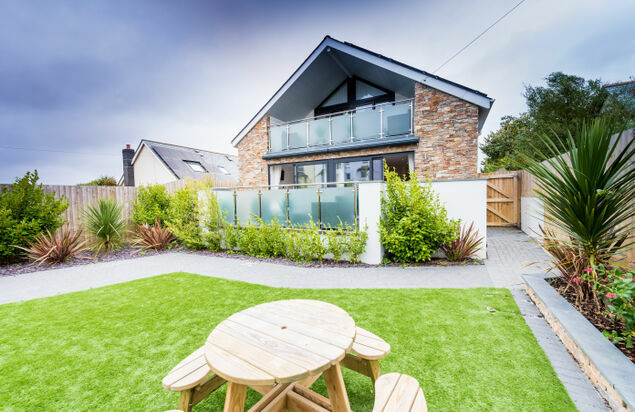 Beachcomber is a luxury 6 person holiday apartment in Westward Ho!, it has a balcony with stunning views over the country park and the sea beyond with a host of luxury features including underfloor heating and an open plan, contemporary style. The Waterfront at Beachside offers stunning views over Westward Ho! beach from a modern, open plan apartment with all your mod cons and a fantastic balcony which is great for watching the surf! 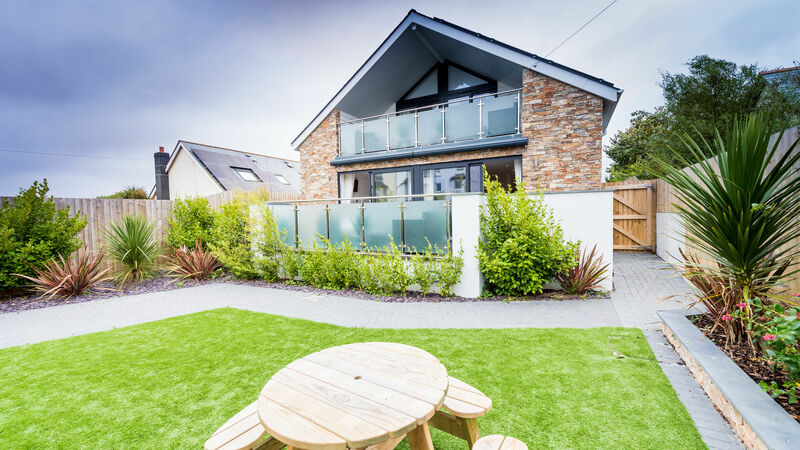 Waterside sleeps 4 with a balcony that has views to Westward Ho! beach, a jacuzzi bath and luxury features such as complimentary toiletries and underfloor heating, Netflix and large tv. Our luxury apartments in Westward Ho! in North Devon offer a range of self catering family holiday apartments in the popular resort of Westward Ho! in two different locations. Our apartments have a range of added extras designed to make your holiday more enjoyable and relaxing from the start. These apartments are ideal for families and are designed for use all year round. Standard facilities include complimentary tea, coffee and toiletries so that your first task on arrival is to sit down and relax. With the benefits of underfloor heating and double glazing, our apartments are comfortable, warm and cosy even in the coldest months of the year. With en suite shower rooms to the master bedrooms in all, you are guaranteed privacy and modern conveniences such as 42" TV's with Netflix in the lounge, 32" TV's with DVD players in the bedrooms, dishwashers and wireless sound systems are all fitted as standard. Each apartment also has its own unique character with additional features such as private parking spaces, hot tubs, balconies with outdoor furniture or even enclosed gardens available in certain apartments. With two locations available including one that has great views over the sea and the main beach at Westward Ho! and the second location having rural views of the stunning Country Park, these locations are all family friendly and are just a short walk from the town centre. You can view each apartments features including photographs and access availability through this web site as well as full terms for booking your apartment holiday in Westward Ho! If you are looking for a beach holiday for your family, browse through the apartments listed here for a great choice and all at fantastic prices.